In 1966/7 the famous Abbey Ballroom Drogheda ran a 5 a side indoor football competition which attracted hundreds of teams from Drogheda and surrounding counties. 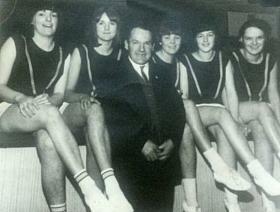 The organisers took the pioneering step of introducing women's leagues - (perhaps for the first time in Ireland?) - and for many women it was their first experience of any kind of sport and they went on to initiate full scale women's teams. Many of the teams in the Men's Leagues and the Women's Leagues were factory or workplace based and huge crowds of followers attended all the games. A group of students from UCD School of Information and Library Studies (SILS) with the assistance of DROGHEDA LOCAL VOICES have carried out an oral history project, talking to both men and women who took part in these leagues. Their reminiscences vividly recall the joy and excitement of life for young people in mid 1960s Ireland, when a highly-confident working class looked to the future with great hope. The exhibition includes photographs, audio recordings and video and will run until Sept 2015.